When I realized that I had an abridged version, I was irritated, but then I remembered that some classic works really should be shorter, so maybe an abridged version wouldn’t be a bad thing. With that in mind, I decided to treat this short version as a taster. I figured that if I love it, I can still indulge in the full meal someday. If not, I’ll at least have gotten a taste. 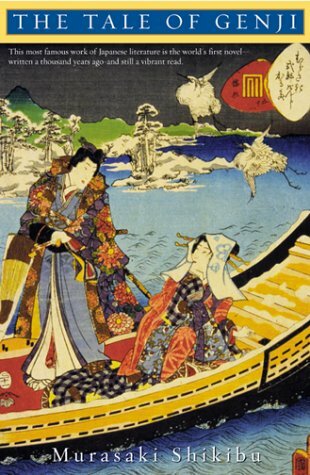 Sometimes called the world’s first novel, The Tale of Genji was written in the early 11th century by Murasaki Shikibu, a woman of the court of the Heian Empress Akiko. The complete text comprises 54 chapters, but the version I read was the 1882 translation by Kenchō Suematsu, which only includes the first 17 chapters. So I guess you could say that I’ve read about a third of the book in what is perhaps an inferior translation. “Can it be,” thought he, “that I am leaving this place as a lover?” At that moment, he remembered that the house of a maiden with whom he had had an acquaintance was on his way home. This is typical of how Genji’s mind operates. Always looking for the next friendly bed, without so much as a break in between. Although I was sometimes amused by Genji’s antics, had the book continued in this vein, I would have lost interest. The many ladies, as well as Genji’s conspirators and friends and political enemies, were overwhelming; and the plot felt episodic with little character development or narrative drive. Just one thing after another. Fortunately, the story eventually took a turn. We start getting more insight into the women in Genji’s life, and Genji himself eventually must face the consequences of his actions. And, in a nifty trick, Shikibu actually made me feel conflicted about some of those consequences. Genji doesn’t exactly reform, at least not by the end of chapter 17, but he does evolve, which is enough for me. To where she dwells in realms above! Gag. Retch. Ick. Now I don’t mind rhyme and meter, but I don’t like greeting-card verse. Otherwise, I thought the translation was perfectly fine, other than being incomplete. It read like 19th-century prose, because it is 19th-century prose. That’s not a huge barrier to understanding for me because I read so much from that period, but for something so long and so far outside my usual comfort zone, I might prefer a style geared more toward the modern reader. After getting a taste with this short edition, I’m interested enough in Genji’s world to want to read the whole thing someday. It may take me years to get around to it, but I can see from the first 17 chapters that it would be worth it. So I leave with a question for those of you who have read Genji: Any translation recommendations for me? It seems like the Tyler and the Seidensticker are the most commonly read versions. From a quick perusal of the first couple of pages online it looks like the Seidensticker is the most readable, which does seem important in a book this long. But I’m open to suggestions. I’m beginning to wish I had the abridged version! One year on and I’m still not half way through this book! and found the Globubz translation the easiest to understand, but I hate reading online. I haven’t seen the Seidensticker translation, so perhaps someone else will be able to say whether that is worth it. Thanks for the link. I’m not sure I could choose between the three you sampled, but I did see that a couple of your commenters liked the Seidensticker, so that’s probably what I’ll look for. It’s okay to cheat, as long as your brain will allow it. What always happens to me with abridged versions of things is that once I know something’s abridged, I can’t stop thinking about it. Every second word I read, I’m thinking, aaaagh, what don’t I know about here? I think it would help if there were a really good introduction in which the abridger explained why she had cut the things she had cut. As far as the abridgment goes, I think it’s mostly just abridged in the sense that it only includes the first 17 chapters, so I could tell myself I’m just reading the first part. Unfortunately, this edition didn’t have much in the way of an introduction, so I can’t know for sure if there weren’t other cuts along the way, but from what I’ve read online about the book, I don’t think there were huge cuts. I am glad to hear there is a Seidensticker translation of this book; I abandoned a dusty old translation after a few chapters years ago. I just read Seidenstickers’ Makioka Sisters and adored his diction. He struck just the right balance between giving you a bit of Western help, so you wouldn’t miss anything important, and still letting you feel like you were inside a different language. It flowed beautifully. Nice to get an endorsement of Seidensticker! That probably will be the one I look for. I almost finished the first volume of the Tyler translation, which I intend to complete someday. I was loving it. It is slow going, but it’s just a slow story. LadyMurasaki had time on her hands and she took it. I think it was originally read one chapter at a time while everyone sat around waiting for Murasaki to write the next chapter. So it took several years for the first people who read it to finish the book. I do like that my edition is illustrated and has some footnotes. There are many things mentioned in the story that are alien to me. Why Genji is still a bit unsympathetic for modern readers by the end of volume one, he has grown as a character and as a man over time. That helps some. When I do read the complete book, I may end up taking it more slowly. The episodic nature of the narrative certainly lends itself to that. And I agree that Genji’s growth makes up for his earlier womanizing ways. I still don’t like him much, but he’s not a caricature. My friend and I were considering reading this together, but I’m glad we didn’t as I don’t know if either or us would like reading about such a lecher so much. Hmm. I wonder why this book is a classic- maybe it’s better in the original language! Well, Genji does grow as the book goes on, but I don’t know how much. As far as the original language goes, I understand that Japanese readers often read it in translation as well because the Japanese is so archaic! And I imagine that the ground-breaking nature of it is one of the reasons it’s a classic. I definitely agree that some classics ought to be abridged (but not my beloved The Count of Monte Cristo)! But I think when I read The Tale of Genji, I’ll try and find a complete one that translates the poetry better. That’s a good plan. I’m pretty sure other translators have done better with the poetry. Don’t worry, most of the Japanese people I know haven’t read it either;) It’s probably because it’s so long and difficult in Japanese. I’ve only read the manga version which was great but already confusing and am planning to read it properly one day. So is it like Canterbury Tales, which people read bits of in school but rarely read in its entirety, or in its original language? I could see parts of this working in isolation. And I love the idea of a manga version! I have the Seidensticker translation sitting on my shelf, though I haven’t yet read it — it’s probably not something I would have purchased, but it’s also way too long for me to want to check it out from the library, so when I saw it on the sidewalk for free I figured I might as well take it. I’m pretty sure that it was the translation that was used in one of the college classes I took — we only read excerpts and it was in a coursepack, so I never owned the book… but I think it was this one, and I think I found it pretty readable. Ah, the allure of a free book on the sidewalk–not that I find free books on the sidewalk, but I’d pick this up too I think. My neighborhood (Park Slope, Brooklyn) has serious books-on-the-sidewalk bounty – I think it’s one of the reasons I love it so much. I think a fair number of people who work in publishing/writing live here, so in addition to just being bookish sorts, they often seem to have old ARCs to give away. I am incorrigible about stopping and looking at all the books I pass, even if it’s a box of books where I can see that the top layer doesn’t have anything I’m interested in. My most recent find was a young adult book in Hungarian (originally in English, but translated), which I clearly had to pick up to show to my friend who took Hungarian in college, even though that was six years ago and she doesn’t remember much of it now. I really enjoyed THE PILLOW BOOK and this is often in the same category (since it was the same century). Too bad you had an odd translation. Poetry is hard to capture. I’ll probably give the whole thing a try some day — but not anytime soon! The poetry was the only thing that really annoyed me about the translation. The old-fashioned style didn’t bother me, although given the choice I’d go for something more modern. I remember Jenny liked The Pillow Book too. I’ll probably tackle the rest of Genji before trying that–and it’ll be a while before I get around to the rest of Genji!